This Sunday, Jean-Robert and Annette de Cavel will welcome hungry citizens of the tri-state to the Midwest Culinary Institute, where they will be holding their annual brunch to raise money for Sudden Infant Death Syndrome (SIDS) research. Eat.Play.Give, the de Cavel Family SIDS Foundation’s annual friends and family brunch, drew a hungry crowd to Midwest Culinary Institute at Cincinnati State on Sunday, Oct. 18, 2015. 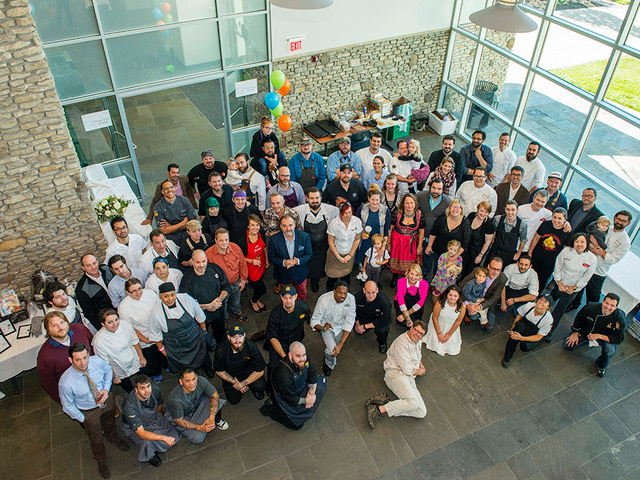 Nearly 40 members of the food and beverage community pose for a group photo before guests enter the event. While they insist their charity brunch is a very small event, they have already raised more than $1 million for SIDS research since they began their efforts. The family hopes that this money eventually leads to finding a cure. If it does, it would mean everything to know that their efforts effected change. “To have a feeling that you were a small part in the contribution, to keep fighting and not giving up, to find a cure, it would be the best thing,” says Annette. The SIDS Brunch will also feature live entertainment, activities to entertain kids, and a silent auction. Among the items being auctioned off are gift certificates to local restaurants, a few secrets donated from the Bengals, and even a couple resort getaways. In the end, the de Cavels want to make sure that while everything is being done to contribute to a very serious cause, that this event remains light-hearted and has everyone leaving with a smile on their face. “It is an event where we want people to have fun. We want people to enjoy, people to celebrate life—celebrate their kids,” says Jean-Robert. The event kicks off Oct. 20 at 11 a.m. at the Midwest Culinary Institute at Cincinnati State. For more information, check out eatplaygive.net.